One of the factors cited as evidence that the US economy is in or headed toward a recession is the number of foreclosures on home loans. Just the other night one Democrat consultant on Fox News cited the number of 40,000 foreclosures in worried tones. Think of that: 40,000 families can’t afford to make their house payments and will lose their homes. When you consider that the average American family is more than three people, that’s well over 100,000 people, in all. That’s as many people as live in a fair sized city. That’s enough people to fill two pretty large football stadiums. Wow! The nation is really in a crisis! So goes the tenor of news stories addressing the “crisis” in the housing market. Problem is, there is no crisis in the housing market; whatever the scope of the problem, the problem is in the subprime mortgage market, which is but a small part the entire housing industry. Subprime mortgages are available to people whose credit isn’t good enough to qualify for a conventional mortgage. Knowing that, do you really think it is surprising that some of them can’t make their house payment? The truth is that 96 percent of all mortgages are being paid on time and, furthermore, mortgage defaults were higher in the 1980s than they are today. And beyond that, thirty percent of American homeowners have no mortgage at all and own their homes outright. What none of the media will report is that only a small fraction of all mortgages are in foreclosure, which is a pretty small proportion to be responsible for a “crisis,” and that same situation exists in most, if not all, of the other economic areas. Employment, for example, is considered full employment if fewer that five percent of the working population is out of work and actively looking for a job. “Recession” is not some nebulous concept without well-defined parameters. A recession occurs when the economy meets certain negative criteria for two consecutives quarters. 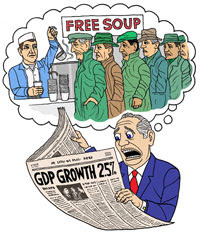 The fact is that a very good case can be made that if—notice I said “if,” not “when”—the economy goes into a recession it will be the product of a news media with an overactive imagination or a desperate need to create news as much as any true economic problems. After all, it’s not news when things are going well, and the 24-hour cable news networks have to look far and wide to find fodder to fill all that time. The media gets all upset when the Dow Jones Industrial Average drops 300 points. And recently when it dropped 600 points, wow, the world was about to end. But think about that for a moment: The Dow is somewhere in the 12,400 range as this is being written. Six hundred points is less than five percent of that number. Now, a five-percent drop is worthy of our attention, but it is not a crisis. And if you remember, the very next day it regained 300 of the 600 points it had lost. Stock markets go up and stock markets go down, and a swing of a few percentage points here and there is not unusual, and it isn’t a crisis. But the media need a crisis to keep people reading newspapers and watching TV and listening to the radio and reading blogs, and they are going to have one, even if that means creating one. By trumpeting bad news in the housing industry, and that consumers are being cautious about spending due to fears of recession, guess what happens? Right. Consumers slow down or stop spending, and guess what that does: it causes other slow downs, in such things as producing goods, which leads to layoffs, etc., etc., etc. It’s a self-fulfilling prophecy. And if the media aren’t manufacturing an economic crisis in order to have something to report, all of this manic behavior indicates that the media have a very poor understanding of economics.